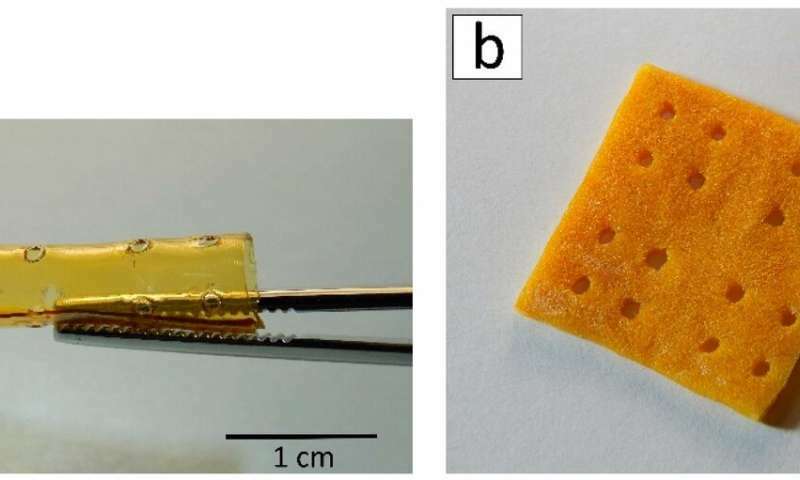 A team of scientists from Sechenov First Moscow State Medical University used 3-D printing to create biocompatible structures on the basis of chitin obtained from crab shells. This method will help develop structures with given shapes for biomedical purposes, including the replacement of damaged soft tissues in the human body. The article was published in Marine Drugs. Shells and other byproducts account for 50 percent to 70 percent of the weight of all crabs caught in the world. As a rule, they are destroyed, which requires additional investment. Only a minor part is processed. However, the bodies of marine crustaceans contain a lot of chitin. This polysaccharide is widespread in the wild—for example, the exoskeletons of insects are made of it. By removing certain acetyl groups from chitin, researchers can obtain chitosan, a biopolymer with a unique set of biological, physical, and chemical properties. It is biocompatible, i.e. does not cause inflammation or immune response when implanted into the body. It also has antifungal and antimicrobial properties and gradually decomposes in the body without leaving any toxic components. That is why chitosan and its derivatives are promising for medicine. On this basis, new types of biocompatible structures can be created to restore damaged tissues or carriers for targeted delivery of drugs. The traditional way of obtaining chitosan from chitin requires treating the raw material with aggressive chemical reagents such as concentrated alkali solutions. Due to the small amount of produced chitosan and the toxicity of the solutions, these methods cannot be used on an industrial scale. The authors of the article suggest a more eco-friendly method of chitin modification—mechanochemical synthesis. The method includes three types of treatment of a solid mixture: with reagents, pressure and shear stress. It requires less alkali than the traditional chemical synthesis, and no solvents, catalysts, or process initiators are required. The chitosan obtained this was may be used for medical purposes without purification and removal of residual toxic substances. The scientists used the same method to synthesize a number of chitosan derivatives with different content of allylic groups (from 5 percent to 50 percent). In the course of such modification, allylic groups (propylene derivatives, organic substituents with a double bond between carbon atoms) are added to the structure of chitosan. This enables chitosan derivatives to form photo-bound films and 3-D structures of any geometry under the influence of UV and laser radiation and in the presence of a photoinitiator. The films made of chitosan derivatives were obtained using the photopolymerization method—polymer solutions in acetic acid were placed on a plastic and irradiated with UV light until they solidified. To form 3-D structures the researchers used a 3-D printing technology called laser stereolithography. 3-D scaffolds are formed layer by layer according to a computer model. A photoinitiator was added to the solutions of chitosan derivatives, and then the photopolymerization reaction was initiated with a laser. The obtained structures were first frozen and then dried in a vacuum chamber (this method is called lyophilization or freeze-drying). After that, the material of the structures became porous. On the final stage of the research, the team implanted the formed structures in rats (under the skin in the interscapular region). The experiment in vivo lasted for 90 days, and none of the implants showed any signs of toxicity during this time. This indicates that the scaffolds are biocompatible. The scientists found that the implanted structures started to biodegrade only after 60 days of the experiments. The team plans to learn how to manage this process and to create implants with required biodegradation speed. "This method of chitosan derivative structuring provides the creation of 3-D structures with physiologically relevant sizes. They can be used to heal large (more than 1 cm) tissue defects," says Ksenia Bardakova, a co-author of the work, and a junior research associate at the department of modern biological materials, Institute for Regenerative Medicine, Sechenov University. "Having studied the stability of the samples in vivo, we demonstrated for the first time that the areas of degradation are distributed periodically, not chaotically. It confirms the hypothesis regarding the mechanism of biodegradation of chitosan-based materials: The least ordered amorphous areas of the polymer degrade first. The understanding of this mechanism will help us form structures in which the rate of degradation would be comparable to the rate of restoration of the replaced tissue or organ. The scaffold would degrade in the precise amount of time that is required by the damaged tissue to restore its integrity and functions." The work is a part of a research cycle on the formation of 3-D structures from hydrogels (with water as the dispersion medium in which solid particles form a 3-D grid) based on natural polysaccharides.